Following quickly upon its recent announcement of flights into Birmingham (see BTN 17 November) American Airlines is again to take rival United Airlines on with a new daily service from Edinburgh to New York Kennedy (JFK) next summer running from May until September. Stobart Air is to operate CityJet’s Cardiff-based routes from today (1 December). Unlike its road transport sister company Stobart Air is very low profile as far as its public awareness is concerned, also flying routes for Aer Lingus Regional and Flybe. French low-cost airline transavia.com, owned by Air France-KLM group, is to launch a Boeing 737-800 year-round new daily service between Dublin and Paris-Orly Airport from next June. London Bridge Station is to close for the popular Thameslink service to Gatwick from 20 December and will not re-open until major reconstruction work is completed in three years’ time. No services at all will operate until 4 January. All trains will call at Blackfriars also stopping at City Thameslink, Farringdon and London St Pancras International. A special timetable will be in force on the whole of the line, which runs from Bedford to Brighton and also includes Luton Parkway for the airport. Aer Lingus Regional is to reintroduce the Dublin to Newquay air route pioneered by Brymon Airways with a DHC Dash 8 in the 1980s. This time it will be an ATR 72-600 with 68 seats against the original 50 again taking around 70 minutes. The current Dublin alternative is via Regional to Manchester and thence Flybe south. Commencing 1 May there will be up to five-times weekly service by summer 2015. The Chancellor’s Autumn Statement is due on Wednesday (3 December). Following last week’s Smith Commission recommendations (see in this issue) it will be interesting to see if he plans to revise APD. Our final issue of the year, Monday 15 December, features the normal first Monday in the month cruising and motoring. It will also include the Christmas quiz with flights for the winner. You must be a BTN subscriber. Travellers using London’s Northern Line Underground should be aware that a strike has been called by the RMT Union for today (1 December). This will affect service from Barnet, Edgware and Mill Hill through to Morden. The strike action has been called by the RMT leadership after one of its members was dismissed by London Underground after failing an alcohol breath test. Pilots at Lufthansa are also going on strike today and Tuesday as their dispute over retirement benefits continues. The walkout, the ninth since April, will affect short- and medium-haul flights across Germany from 12.00 (11:00 GMT) until 23.00. A 15-strong independent Task Force has been created to examine the current and future requirement for improved connectivity between the UK’s regions and the major hub/gateway airports short-listed by the Airports Commission. As the only car hire supplier actually on Heathrow property, Avis tells BTN that its recently refurbished location at Heathrow is now fully operational. Sited just off the Northern Perimeter Road, close by the A4/M4 extension junction and Renaissance hotel, it serves Terminals 2, 3 and 4 with a regular courtesy bus service. At T5 Avis is situated on level 4 in the Short Stay Car Park. British Airways has combined with Heathrow Express and First Great Western to make travel easier for customers in Wales and the West of England. A single booking will now join together the airline and the train companies. Passengers can book from 5 December through travel agents for travel from 11 First Great Western stations. Ryanair won a nebulous victory in the European Union's second-highest court last week regarding its complaint against Ireland's version of APD. The airline had argued that the tax, not levied on transit passengers, constituted state aid for the benefit of rival Aer Lingus and (now) Aer Lingus Regional as they had a higher proportion of passengers transferring in Ireland. The eagerly awaited new rail franchise for the east coast has been awarded to Inter City Railways, a consortium of Stagecoach and Virgin Group from March 2015. The new operator takes over from the publicly owned East Coast Main Line Co Ltd, who replaced National Express East Coast in November 2009 when that company failed. East Coast is profitable and has built up a fine reputation as a service provider, albeit with very old rolling stock. The Park Inn by Radisson London Heathrow has launched its stylish new Aviator conference facilities. The refurbishment includes 41 conference rooms and 26 syndicate rooms. With 895 bedrooms, the hotel now has the largest capacity in Heathrow for residential conferences. It claims to be the nearest hotel to Heathrow Central, situated at the junction of the M4 extension, Bath Road, Heathrow Tunnel. Qantas has gone retro. Celebrating 94 years the former Queensland and Northern Territory Ariel Services is putting into operation a Boeing 737-800 (VH-XZP), the 75th of the aircraft type, and named after its former CEO James Strong, who passed away in 2013. It is the 11th new Boeing aircraft that the Qantas Group has taken delivery of this year. Your Editor was on one of the first ever Singapore Airlines (SIA) flights from Sydney to Heathrow. He recalls that the Boeing 707 seemed to stop everywhere, and with the innovation of unlimited free beer some of the Australian passengers got rather inebriated. The official journey time for the Singapore – London leg was 17hrs 35mins – compared with 12hrs 40mins today the A380. The Smith Commission on taxes devolved to Scotland has recommended that Air Passenger Duty (APD) should be included in the package. The UK Civil Aviation Authority (CAA) has published new guidance for British airports setting out key principles and recommended practices to help airports work effectively in partnership with airlines, ground handlers and other organisations so they are better prepared for large disruption and can manage it effectively when it occurs. Philadelphia, home of the liberty bell, is to be added to the Delta/Virgin Airlines network from the UK. Formerly a US Airways route American Airlines is also to double its operation to the United States fifth largest city with a new Heathrow 08:20 departure, adding to the long standing 12:05 service. 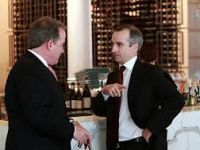 Just prior to completing the transaction, James Hogan, Chief Executive of Etihad, was elected to the Virgin board. Hogan told Virgin investors that Etihad was not only a shareholder but also a “long-term and active investor” in Virgin Australia. Etihad earlier this month received approval for its 49% stake in ailing Italian carrier Alitalia and has made major investments in Air Berlin, Aer Lingus, Air Seychelles, Air Serbia and Jet Airways of India. Brussels was the location for Hilton Hotels & Resorts latest opening on 17 November. The Hilton Brussels Grand Place, a landmark building in the centre of the city is now welcoming guests, signalling the start of an exciting era of transformation for the hotel, with significant refurbishments commencing in the coming months. You may ask “who is Ruili Airlines?” If your business takes you to China's Yunnan province in the South West of that vast country, and bordering Laos and Myanmar, (Burma) you may need to fly on the new low-cost carrier. Only established last year the airline received its Air Operators Certificate (AOC) from the Chinese authorities (CAAC) on 14 January 2014. It has celebrated the arrival of the airline's first direct purchase Boeing 737-700 NG. It will not have a use at major airports but Snoozebox, the unique accommodation package, may have an application for airports needing temporary sleeping accommodation.